McCain Takes Swipe At President For Vietnam 'Bone Spur' Deferment : The Two-Way In an interview on C-SPAN, the Arizona senator criticized "high income" Americans who avoided the draft by finding a doctor who "would say that they had a bone spur." Sen John McCain, R-Ariz., returns to his office after a series of votes at the Capitol in Washington on Thursday. In a week that saw two of President Trump's predecessors issue thinly veiled warnings about where the country is heading under Trump's leadership, Arizona Republican Sen. John McCain fired off what appeared to be a long-delayed riposte to the man who once mocked his war record. In an interview broadcast Sunday on C-SPAN, McCain spoke on the 50th anniversary of his being shot down over North Vietnam — an event that led to his capture by communist forces and a 5 1/2-year stay in the infamous "Hanoi Hilton" prison. 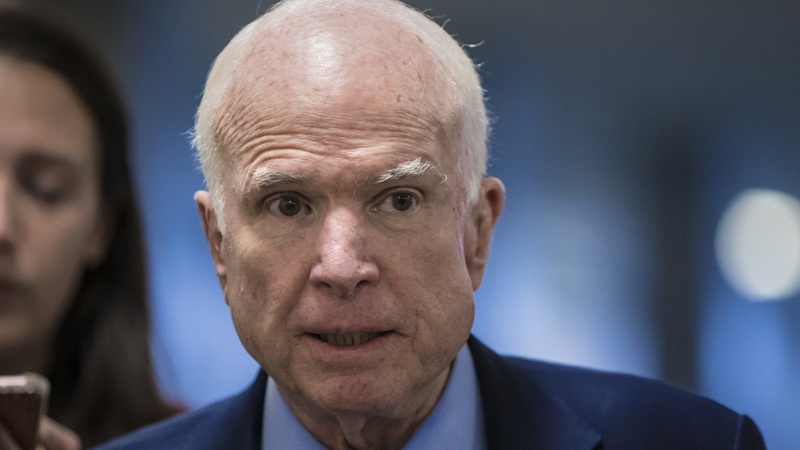 "One aspect of the conflict, by the way, that I will never ever countenance is that we drafted the lowest-income level of America, and the highest-income level found a doctor that would say that they had a bone spur," McCain said, in an apparent reference to the diagnosis that allowed Trump to be medically disqualified for service in 1968. "That is wrong. That is wrong. If we are going to ask every American to serve, every American should serve," said McCain, the son of an admiral who refused an offer of early release by his captors despite being tortured. In 2015, then-candidate Trump said McCain was a war hero only "because he was captured." "I like people that weren't captured," he said. During the Vietnam War, Trump had obtained four educational deferments before graduating from college. After receiving his diploma, he was again eligible for the draft. But an armed forces physical examination in 1968 deemed him medically unfit. In an interview last year with The New York Times, Trump said the bone spurs that kept him from being drafted were "temporary." "I had a doctor that gave me a letter — a very strong letter on the heels," he told the Times. "Over a period of time, it healed up." McCain's remarks come amid a growing chorus of concern from both sides of the political aisle over President Trump's leadership. Last week, McCain warned Americans against a wave of "half-baked, spurious nationalism" that he said had taken hold in the country. There were also strong words from former Presidents Barack Obama and George W. Bush. Campaigning in Virginia for Democratic gubernatorial candidate Ralph Northam, Obama said the race was important "because our democracy is at stake." "Folks don't feel good right now about what they see," Obama said. "Instead of looking for ways to work together and get things done in a practical way, we've got folks who are deliberately trying to make folks angry, to demonize folks who have different ideas to get the base all riled up because it provides a short-term tactical advantage." And Bush, speaking at a forum put on by the George W. Bush Institute, decried that in America today "bigotry seems emboldened." He said the national discourse had been "degraded by casual cruelty" that "escalates into dehumanization" and a "nationalism distorted into nativism."